The Municipal Theatre "Apollon", symbol of the cultural development of Syros, was built in 1864 and designed by the Italian architect Pietro Sampo. The two-storey building situated at the end of the street Melina Mercouri on the square I Vardaka is simple externally with the central section of the front fully made of marble. 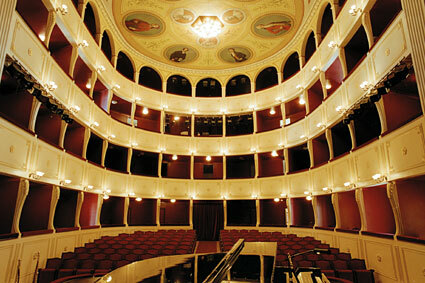 It is widespread thought that the Apollo Theatre is a miniature of La Scala in Milan, but in fact the design is influenced by Italian standards like La Scala in Milan, the renovated theater San Carlo in Naples, the academic theatre in Castelfranco and finally the Teatro della Pergola in Florence, while the vaulted roof seems to follow the French system of the 19th century. The theater operates throughout the year mostly hosting performances by local amateur theater groups, but also the events under the summer cultural events of Syros, "Ermoupolia." Open daily and Sundays 11.00-14.00, Friday and Saturday 11.00-14.00 and 18.00-20.00. Closed on Monday. Tel 22810 85192.Entry Price 2 euro, and for groups and students 1.50 euro.